It’s been a sensational journey for Conor McGregor; from a young man doing an apprenticeship to become a plumber, to the crown at the top of the combat sports pyramid. It all started in Straight Blast Gym on the outskirts of Dublin under the tutelage of Coach John Kavanagh. When a young McGregor turned up to Kavanagh’s gym, he was a brash, confident boy who hadn’t quite found his way. He had stepped in and out of the boxing gym, but lacked the focus he is now famous for. 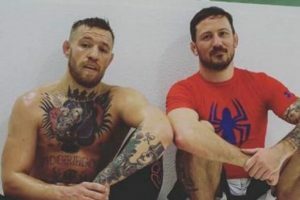 Kavanagh actually recounts a story of having to teach an inexperienced McGregor a particularly harsh lesson on the mats after an incident with one of the gym’s more experienced fighters. McGregor was dogged and wild, but he was also undoubtedly talented. Despite the fact his father thought he’d be better off gaining a skilled trade, Conor continued his quest to learn the fighting game and under the guidance of Kavanagh, he made his way into the professional stratosphere. 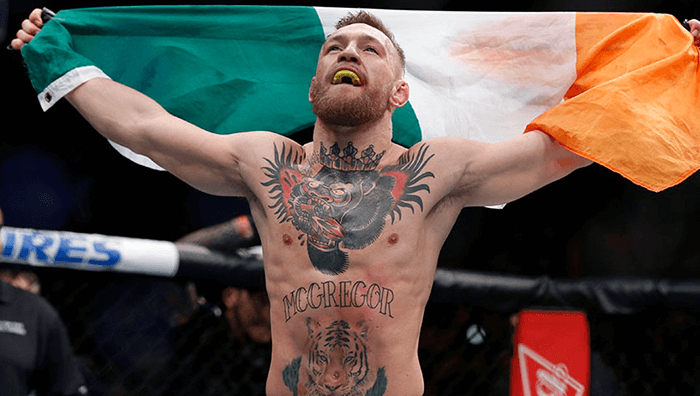 In his opening two fights, McGregor showed off epic knock-out power and finished both men. However, it proved to be third time unlucky for Conor when facing Lithuanian Artemij Sitenkov. The Notorious was taken to the ground where his grappling was badly exposed. John Kavanagh’s ethos is built around the statement “win or learn” and McGregor ended up choosing the latter. It wasn’t long before he was back knocking out opponents once again though. However, the immensely talented Joseph Duffy managed to get a win against him, once again via submission. McGregor took this in his stride and he won his next 16 fights, winning Cage Warriors titles in two different weight classes and the UFC title against Jose Aldo along the way. His first fight in the UFC came against Marcus Brimage. Famously, the man who now earns over a million for every fight, stopped on his way to the airport to collect his €188 welfare money. He won $60,000 that night with the knockout of the night and the famous “Dana, 60 Gs Baby” call was uttered. DANA, 60G's BABYYYY! - The Notorious Conor McGregor Click To Tweet After that win, it was obvious to the UFC that they had a star on their hands. His next few wins came at the expense of several fighters who went onto have great careers in the UFC – Max Holloway got dismantled by McGregor, while Dustin Poirier was knocked out in the first round. He also chopped down the likes of Denis Siver and Diego Brandao. A title shot followed, but the then-champion Jose Aldo pulled out. McGregor fought Chad Mendes for the interim belt and put in one of the greatest performances in the history of MMA. Mendes used his wrestling to dominate The Notorious, but McGregor withstood the onslaught and finished him in the third round. Next up was Jose Aldo. Most people didn’t give McGregor much of a chance against the greatest 145lb MMA fighter ever. The Notorious proved everyone wrong by knocking him out in 13 seconds. He was then supposed to fight Rafael Dos Anjos, but the Brazilian dropped out and in-stepped Nate Diaz. This spawned an amazing rivalry, where Diaz surprised the world with a submission win in their first bout, while McGregor got a decision in the second. The third is yet to come, but keep a close eye because we certainly wouldn’t rule that one out. McGregor, being the history maker he is, then took on Eddie Alvarez in the first MMA event ever held in Maddison Square Gardens. He was barely touched in that fight and took apart a future hall-of-famer. Alvarez was made look like an amateur. During all of this, The Notorious was insisting that there were mountains he wanted to climb outside of MMA. His business ventures have led him to a place on the Forbes rich-list; he has also seen the birth of his first child and helped out several top future contenders. Now is the biggest challenge of all – stepping into the Boxing Ring in the attempt to defeat boxing legend and 49-0, never been beaten, never been knocked down Floyd Mayweather Jr. It seems like Everest, but maybe not to a man who is used to making molehills out of mountains.